The famous aerial show Airexpo will take place on Saturday 20 May 2017 at the Muret-Lherm aerodrome. It is one of the largest meetings in France after the Paris Air Show and La Ferté-Alais. Rafale, Morane, Fouga Magister, ATR 72, Falcon 50, Breguet XIV ... Get ready for an exceptional air show! Chaired by Michel Drucker , the 31st edition of the Airexpo airshow will take place on Saturday 20th May 2017 at the Muret-Lherm (Haute-Garonne) aerodrome. Over the years, this event has become one of the biggest meetings in France after the Salon du Bourget and La Ferté-Alais . Some 20,000 visitors are expected to attend the event. 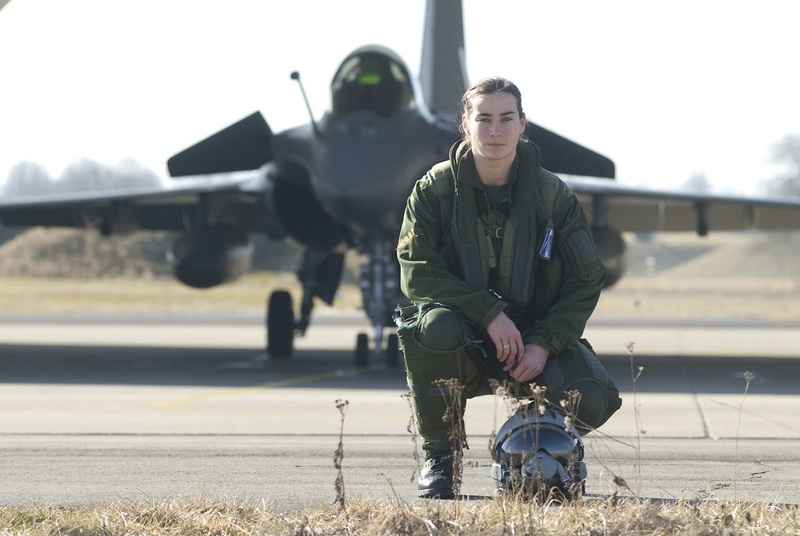 Claire Mérouze, first female pilot of a Rafale, will this year be the godmother of the meeting. More Rafales For India Likely In 2018, Dassault CEO..!! Dassault Group CEO Eric Trappier said on Sunday that negotiations were underway with India for a new contract to sell at least fifty French Rafale combat aircraft. "After the contract signed in India for the delivery of 36 Rafale aircraft and the ordering of 24 of these aircraft by Egypt and 24 by Qatar, we will soon conclude a fourth contract abroad, It will be for 2018, "said the CEO of the aircraft manufacturer, present in Mérignac (Gironde) for the 80 years of Military Air Base 106 and an airshow. "We are in negotiations with Malaysia for 18 aircraft, but also with India for a second contract," he told our colleagues of the newspaper Sud-Ouest. "The needs in India are immense. So, for the Navy, there are 57 aircraft, "he said, adding that" Asia will be strategic for us in the years to come, especially India. With deteriorating ties with Pakistan, its closeness with China and the latter's aggressive military exercises and an increase in Indo-China border patrolling, the Indian Air Force has decided to deploy Rafale jets in Ambala and Hasimara. 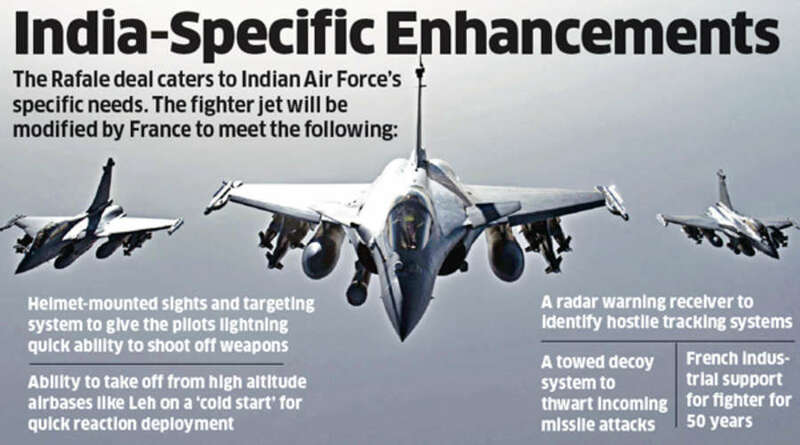 IAF's plan to station the fighter jets at eastern and western front will make it combat ready. The Indian Air Force is going to deploy its latest Rafale combat aircraft at Ambala in Haryana and Hasimara in West Bengal. The Indian military has been preparing itself for a two-front war. Rafale jets are supposed to be delivered from September 2019 onwards. Faced with a two-front war scenario against Pakistan and China, the Indian Air Force is going to deploy its latest Rafale combat aircraft at Ambala in Haryana and Hasimara in West Bengal. In September 2016, India signed a deal with French Dassault Aviation toprocure 36 Rafale fighter jets for close to Rs 60,000 crore to arrest the fall of combat squadrons and meet urgent requirements on the eastern and western fronts. "One squadron (comprising 18 aircraft) would be based in Ambala, while the other would be deployed at Hashimara. These would cater to requirements on both the fronts," a government official told Mail Today. After aggressive patrolling by the Chinese on the eastern and northern borders and its increasing defence ties with Pakistan, the Indian military has been preparing itself for a two-front war and developing infrastructure on both sides. The earlier plan was to deploy one squadron at Sarsawa air base in Uttar Pradesh, but that did not work out due to land acquisition issues, after which Ambala was chosen. The Ambala base has some jaguar aircraft squadrons catering to the western front. On the eastern front, the Hasimara air base close to the China border would see Rafale planes replacing the exisiting MiG 27 squadrons, which are on their way out of the air force. 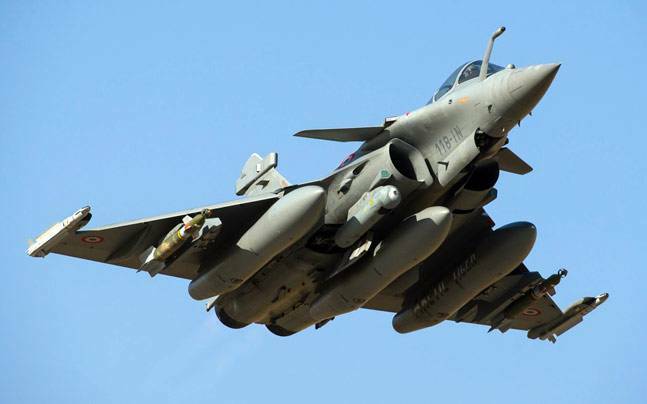 In presentations given to the Prime Minister's Office (PMO) before the acquisition was finalised, the service had stressed that on the China front, it would require a plane like Rafale due to its long range capabilities. The Air Force has rated Rafale planes higher than Su-30 MKIs, 272 of which have been ordered by India from Russia. On the Chinese front, the PLA Air Force bases are deep inside the Tibetan plateau with the nearest base being over 150 km away from the Indian border. Sources said the French aircraft manufacturer has already started the process of building the aircraft, and they are supposed to be delivered from September 2019 onwards. "We are requesting the French to advance the deliveries to meet our requirements and hope to get a positive reply," the official added. The process of developing the infrastructure at air force bases has also started and they would be ready by the time the aircraft fly in for operational service. The Air Force has already started the process of replacing its ageing fleet of MiG series planes on the eastern and western fronts, as it has been replacing the old MiG-21 variants with Sukhoi-30s acquired from Russia. On the eastern front, where aircraft with long range capability are required, the IAF has already based Su-30MKIs at Tezpur and Chhabua air fields, while it has deployed them close to the Pakistan front in Sirsa (Haryana), Halwara (Punjab) and Jodhpur (Rajasthan). The planes also operate from Leh, bordering both Pakistan and China and are capable of swift deployment in no time. On the week of May 14, the Air Force led Operation POKER . This exercise was aimed at training the strategic air forces ( FAS ) to carry out a nuclear raid. Many means have been deployed to make this exercise as realistic as possible. The objective of Operation POKER has been described by the Ministry of Defense as being "aimed at demonstrating the operational capability of the SAFs through a long-term mission over the national territory". The aim is to do everything possible to make the operation as realistic as possible. The pilots of the FAS as well as the mechanics are mobilized. They are faced with an exercise reproducing the actual conditions in the event of a nuclear raid in order to "be able to operate on the ground under NRBC conditions" (nuclear, radiological, biological, chemical). For this, the Air Force mobilized numerous aircraft (about fifty). The system was supplemented by "a thousand staff". At the level of SAFs , C135s of the refueling group 2/91 "Bretagne", Mirage 2000N belonging to the 2/4 La Fayette fighter squadron and the Rafale Bof the fighter squadron 1/4 "Gascogne "Were mobilized. "The crews of the Mirage 2000 C of Orange, 2000 D of Nancy and 2000-5 of Luxeuil, Rafale C of Mont-de-Marsan, and E-3F of Avord have also contributed to the success of the operation "Reports the Ministry of Defense. The training flight lasted several hours. He mobilized pilots on different techniques, such as high-altitude flight, low-level penetration and in-flight refueling on C135 . The issue of nuclear raids comes not only from the technicality of the maneuver, but also from enemy forces. Thus, "the raid had to escape the enemy air and ground threats, played in particular by the Squadron of Avord air-ground defense." The entire exercise was carried out under the so-called "silence" procedure. This method does not allow the use of GPS and the use of radio broadcasts is not allowed. The POKER operation is conducted several times a year. This exercise was the second of the year 2017. The strategic air forces have been mobilized for more than 50 years to guarantee "the operational permanence of the airborne component of the French nuclear deterrent". I like how Google Translates alternate between changing FAS to SAF, and leaving it alone. Louis Ebel: "At Airexpo, fans will discover the planes of the future!" Without the Patrouille de France, detained in the United States, the 31st edition of Airexpo will nevertheless have many assets all day long at the Muret-Lherm aerodrome. His young president, Louis Ebel, explains why. Interview. Louis Ebel, can you remind us of Airexpo's raison d'être? For 31 years, Airexpo offers the unique opportunity to a team of forty students to pass on its passion for aeronautics by organizing a large airshow. With a notoriety that keeps growing, Airexpo has established itself over the years as one of the largest meetings of the Hexagon. In reality, Airexpo is part of a dynamic of continuous evolution and innovation which gives each edition a new face for the greatest pleasure of the spectators present. Flight demonstrations delight the eyes of young and old alike. This year again, we will discover our passion for aeronautics in a new light, with the theme of tomorrow's aviation. Can you give us the non-exhaustive list of planes on the ground and, most importantly, those who will be demonstrating? There will of course be the star of the air, the "Rafale", the fighter aircraft par excellence, but also the "Falcon 50" of the Naval Aviation, the little "Cricri" that will take off the roof of a BMW (! Not to mention the latest Airbus industry, the A 350-1000 and the ATR 72-600. And nostalgic will of course have right to the Fouga "Magister" whose first flight dates back to the year 1953. I will say the electric helicopter "Volta", which will be the first demonstration in a meeting. One project is to be recalled by the National School of Civil Aviation (ENAC). And the public will not miss the aerial aerobatic demonstrations of the Air Force carried out by the EVAA including company of the world champion Alexandre Orlowski. Other names announced on this 31st edition? Yes, and not the least! We have this year the chance to have as president of honor a certain Michel Drucker. As for our godmother, it is Claire Merouze, the first female pilot fighter on plane "Rafale". Some tips for a successful day? How beautiful it is! And that the visitors come to the light airfield, without too much to load, because we are in Vigipirate plan reinforced. And if it is sunny precisely, do not forget the cap, because the hot shots are quickly arrived! for flying with her on rafale as co-pilot what were you guys thinking!!! of the Tiger/Tigre attack helicopter. 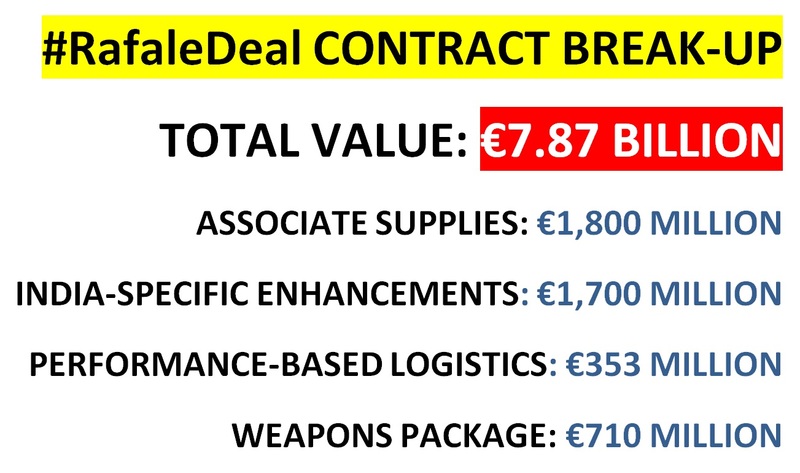 .....A 50% offset clause worth around €3bn has yet to be signed, learns AEROSPACE. As part of the offsets, France has offered an investment of €1bn to revive India’s stalled Kaveri Gas turbine project by Safran to jointly develop the engine to power the indigenous Low Combat Aircraft-Tejas by 2020. Safran’s M88 powers the Rafale. Thales provides systems on board, including the RBE2 AESA radar, a joint venture with Samtel Avionics. The JV develops, customises, manufactures, sells and maintains helmet-mounted sight & display (HMSD), optronics and other avionics systems for the Indian market. “The offset clause will provide an opportunity for indigenous manufacturers …It outlines the commitment made by the Indian government to promote the Indian manufacturing industry. The future holds an opportunity for India to become a global manufacturing hub for these fighter planes in case there is successful transfer of technology,” said Puneet Kaura, MD and CEO Samtel Avionics. anant_s and Agent_47 like this. GENEVA - Dassault Aviation is waiting to learn more about Canada's request for information on new combat aircraft and hopes to start discussions with India in 2017 for an additional Rafale command before the launch, Opening of negotiations in 2018, said Sunday its CEO Eric Trappier. Canada said on Thursday it was re-examining its plan to buy military equipment in Boeing, in reaction to the US manufacturer's accusation that the Canadian Bombardier is selling at a loss of the US CSS series while receiving subsidies unlawful. Last November, Canada said it wanted to buy 18 Boeing Super Hornets in a transition phase before a more complete replacement of its fleet of fighter jets. Dassault Aviation has responded to a call for information. According to industry sources, the Canadian government discussed in 2016 with Eurofighter, Lockheed Martin and Saab. "We are in a phase where I do not know (...) if they are still in a tender in which we are candidates or if they are in a negotiation by mutual agreement," said the CEO of Dassault Aviation, Eric Trappier, to Reuters on the sidelines of the press day of the Ebace business aviation fair which starts on Monday in Geneva. In India, where Dassault Aviation signed a long-awaited contract for 36 Rafale in September 2016, Eric Trappier said he is working on an additional order for the Air Force and also in the tender For 57 aircraft for the navy. "There is no negotiation, we are not there yet: we are waiting for a discussion by mutual agreement," Eric Trappier said, hoping to have discussions in 2017 and then full negotiations in 2018. © Egyptian MoD - A Rafale EM with the rolling and equipped of missiles MICA IR and EM. Yesterday Friday, May 26, 2017, the Coptic Christian community in Egypt was once again victim of a new attack carried out by the Egyptian branch of the Islamic State organization, located in Sinai. On board three pick-ups, the jihadists stopped and attacked the bus that was going to the monastery of Saint-Samuel, located 200 km south of the city of Cairo in the province of Minya. The record of the attack is heavy since 29 victims are to be deplored, including children according to the Egyptian authorities. In response to the attack, the Egyptian President, Marshal Abdel Fattah Al-Sissi, stated in a television speech that the Egyptian Air Force had carried out air strikes against positions of the Islamic State Organization in Libya. Indeed, on the night of May 26-27, 2017, F-16C / D Block 52 took off from the Cairo-West air base to carry out six air strikes against "terrorist training camps" located in the vicinity Of the coastal town of Derna, located in northeastern Libya. According to information (photos and videos) published by the spokesman of the Egyptian armed forces, this air raid was supported in the air by the presence of one or more E-2C Hawkeye airplanes of the 601st AEW Brigade, As well as by Rafale EM / DM which ensured superiority overhead. The latter, piloted by Egyptian fighter pilots, were equipped with two air-to-air MICA IR (Infrared) and two MICA EM (Electromagnetic) missiles and carried three external fuel tanks of 2,000 liters. Other scenes, showing unarmed Rafales have been added to the video that evokes this air raid in Libya. However, it is unclear whether the photographs were taken during the mission or were prior to this operation and that they were added here to mention the participation of the Rafales. What is certain, however, is that at least two Rafale have actually been engaged, including the Rafale DM02, one of the first three received by Egypt, and a Rafale EM (single-seater), which arrived in Egypt in April 2017 . 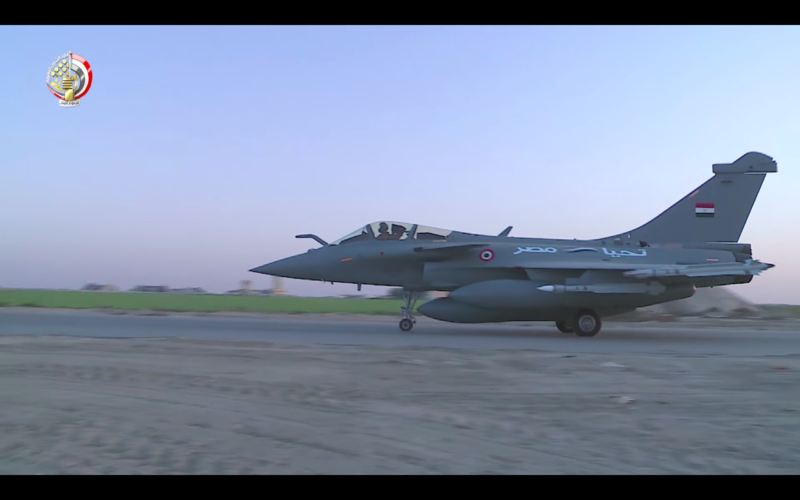 Officially, it is the first time that the Egyptian Air Force (Al-Qūwāt al-Gawwīyā al-Miṣrīy) evokes the participation of its Rafale EM / DM in the context of an operational mission. On the F-16C / D Block 52 side, the aircraft were equipped with three external tanks, conforming tanks (CFT) and, depending on the aircraft, GBU laser guided bombs or Mk82 smooth bombs unguided. The Anglo-French UCAV will use a double-leading-edge planform similair to that used on North Grumman's X-47. Britain and France have quietly selected Safran’s M88 engine to power the joint unmanned combat air vehicle (UCAV) demonstrators the two countries plan to fly in 2025, officials close to the program have said. A derivative of the engine will be developed for use inside the aircraft, which will use a double-leading-edge planform similar to that used on Northrop Grumman’s X-47, the design of which is being displayed in model form here at the show. The decision on the planform and the engine are among the key decisions made as part of the £200 million ($US254 million) joint Future Combat Air System (FCAS) feasibility study, agreed on at the 2014 Farnborough Airshow. The two countries are currently involved in a 12-month complementary phase of study, known internally as Phase 0, which is working to refine the concepts and technologies the air vehicles will use as well as define issues such as work share, as well as how the testing regime may look. The next step – due to start before the end of 2017, and known as Phase 1 – will be a preliminary design and development phase expected to last three to four years. The demonstrators will be significantly scaled up from the European Neuron and the British Taranis demonstrators that have gone before it, and will be as large as the Dassault Rafale but with a larger wingspan. The program has now attracted the attention of the French Navy, which joined the program in 2015 with a view that the system could eventually be employed on its Charles de Gaulle aircraft carrier. Among the areas being explored by the development teams is more extensive use of artificial intelligence to assist the ground operators on mission planning, target acquisition and on-the-fly analysis of threats. However, officials note that the capabilities being developed for the UCAV could also apply to upgrades to the Rafale. Technologies being developed for the UCAV’s future radar will likely feature in the Rafale’s future development road map. The French defence procurement agency DGA is highlighting progress on the upcoming F3-R standard of the Rafale combat aircraft. The next standard of the Rafale combat aircraft, F3-R, is on track for qualification in 2018, followed by entry into operational service a few months later, according to the French defence procurement agency, DGA. The DGA is highlighting the Rafale F3-R on the stand of the French ministry of the armed forces – as the French ministry of defence is now officially known – during the Show. During the first half of 2017, testing has proceeded according to schedule on the Meteor missile and the Talios targeting pod, the two major new equipment items on the F3-R. The final integration test firing of the Meteor long-range air-to-air missile has been successfully completed at the DGA’s Biscarosse test centre. This very long range test against an aerial target was closely followed by a simulated launch of a Mica missile against a separate target – a scenario representative of the new capabilities enabled by the combination of the Meteor missile and the Rafale’s long-range RBE2 AESA radar. The DGA notes that this Meteor missile/AESA radar combination is expected to keep the Rafale at the cutting edge of combat aviation for many years to come. The third and penultimate operational aptitude test of the new Talios targeting pod has also been completed, at the DGA’s Istres test centre. A Rafale equipped with a Talios pod was put through several operational scenarios covering the pod’s broad spectrum of applications, including close air support for troops in contact with the enemy and tracking of mobile targets. Long-distance imaging performance was also evaluated against targets in different types of environment: urban, rural, maritime, mountain terrain. According to the DGA, the tests underlined the high accuracy of ground target coordinates and the excellent quality of imagery, described as superior to current systems in terms of image resolution and sharpness. Eric Trappier: "We will have other orders of Rafale in India"
The CEO of Dassault Aviation explains to BFM Business's microphone hopes of other orders of Rafale in India because the "Indian need is strong". He also acknowledged that the business environment remained difficult on business aviation. Will this 2017 Bourget show be a good vintage? For Eric Trappier, CEO of Dassault Aviation, the answer is rather yes. "We still have a very high level of orders, especially at Airbus. We also take orders, order Falcon from all the manufacturers of the sector, which is very active but also very competitive, "He told the BFM Business microphone. 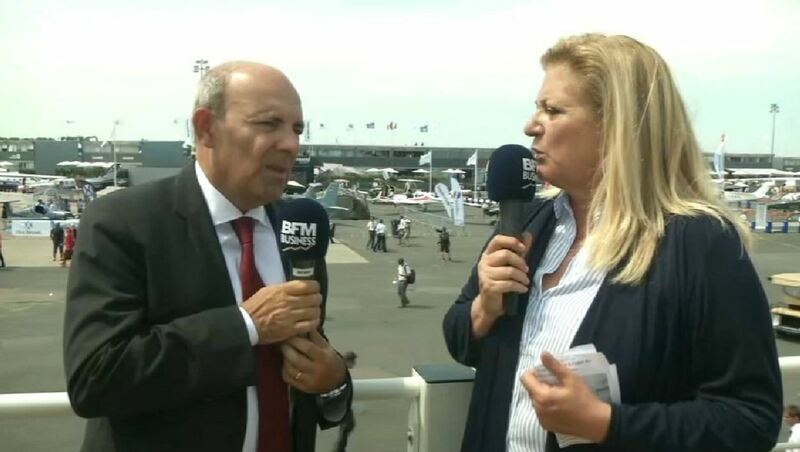 Obviously for Dassault Aviation, the Paris Air Show is not the ideal place to sell its military aircraft Rafale ("it's not very easy, nor very discreet", explains Éric Trappier). But Le Bourget is the opportunity for the Rafale "to demonstrate its ability to maneuverability, which is very important," reminds the CEO of Dassault. Asked about the prospects for orders, Eric Trappier recalled that Dassault Aviation had started in India with 36 Rafale aircraft ordered. "We will continue with other orders because the Indian need is strong, we are working on it, we first make the 'made in India', that is to say that we are settling in India with an Indian partner. This is the new form of international trade: cooperating with local industry, "he said. Concerning Dassault's other flagship aircraft, Falcon business jet Eric Trappier acknowledged that the level of orders was " still a little flat ". "The second-hand market is still important, so we have to continue to sell second-hand aircraft first, so that prices go up a little, so that the gradual return of orders takes place. A little disappointing this year, as last year.We are not expecting a fantastic year but we have a lot of negotiations going on and we hope that the economic recovery will help develop the Falcon segment, -t it.